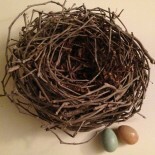 A COMPLETE Empty Nest | A COMPLETE, Empty Nest. Why “A COMPLETE Empty Nest? Honestly, I’m not sure I will ever love the title for this blog, but I chose it because it’s the phrase that kept coming back to me as I was trying to decide. All the others were specific about one area of my life or another and I didn’t want to pigeon-hole this into one specific area. I AM an empty-nester; a COMPLETE empty nester as my spouse left the family nest almost 4 years ago, and 2nd of 2 children left in August 2013, and it has changed almost every aspect of my life. Because I want to write about more than one (or five or ten or more) things, then maybe “A COMPLETE Empty Nest” is a good synonym for “My Life”. We’ll see. While my empty nest became mine in August of 2013, it was never one I wanted and not one I have easily adjusted to. I was once one of four in my little family: myself, my (then) husband, Michael, my son Cody, and my daughter Sophia. Cody left first when he went off to college. I spent every day of his last year at home saying, “That was the last first day of school”, or “That was the last homecoming”. I was never one of those parents who happily counted the days until their offspring moved out. Nope. I mourned every ‘last day’ of his time with me. While he returned for a brief appearance for a summer stay with a friend, he was happily on his way to his own life. Because our house was the house all his friends hung out at, when Cody left, I lost him AND all of them. I think I walked around shell-shocked for 2 weeks, missing the happy noise that had always accompanied my son and his friends. I lost Michael 3 1/2 years ago when I divorced him after no longer being able to fight his mental illness battles with him. The decision to leave the marriage took years as I had not taken my marriage vows lightly. In the end I do not at all miss the stress that comes with living in that world, but I do miss my lost future as a married woman with a companion to come home to every day. Sophia was the last to exit the nest via her college freshman year which began this past August. As with my son, my heart broke a little every day, but this time her leaving the nest didn’t mean just one less person, it meant I would be alone. Alone. (the cats don’t count!) Not what I had bargained for. In addition, Sophia had a few large boulders in her path her first months at college, prompting us both on more than one occasion to say, “Maybe this wasn’t the best idea…..” But here we are in February, and the sun manages to come up every morning. I’ll write later about what those first weeks and months have been like without Sophia and life as it was then. For now, thanks for checking out my attempts at satisfying the urge to write. This entry was posted on February 9, 2014 by renetmyers.